This slab, which resides in our Geology 200 teaching collection, was found at the famous Caesar Creek locality in southern Ohio. 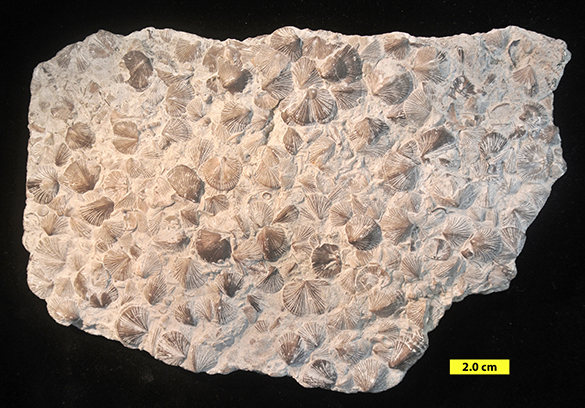 It is from the Waynesville/Bull Fork Formation and Richmondian (Late Ordovician) in age. You may see some bryozoans in this closer view. This bed is a typical storm deposit in the Cincinnatian Group. 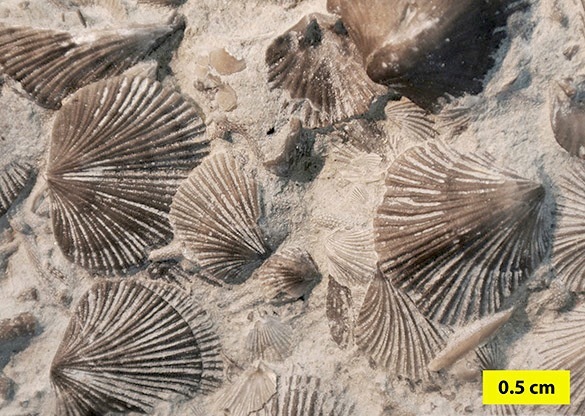 The shells were tossed about, most landing in current-stable conditions, and finer sediments were mostly washed away, leaving this skeletal lag. Jin, J. 2012. 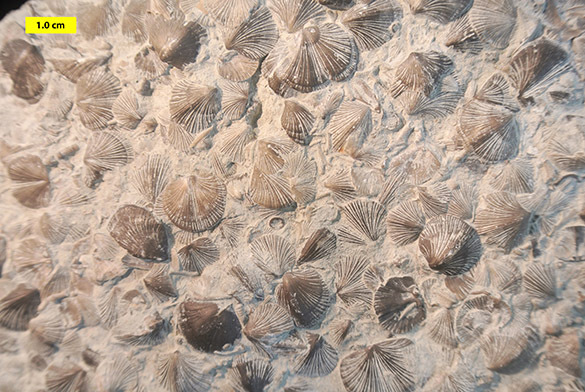 Cincinnetina, a new Late Ordovician dalmanellid brachiopod from the Cincinnati type area, USA: implications for the evolution and palaeogeography of the epicontinental fauna of Laurentia. Palaeontology 55: 205–228. LOCKPORT, NEW YORK (August 7, 2015) — Today Andrej Ernst and I were able to join Brian Bade and his friends on a collecting trip up Buffalo Creek in Erie County, New York. 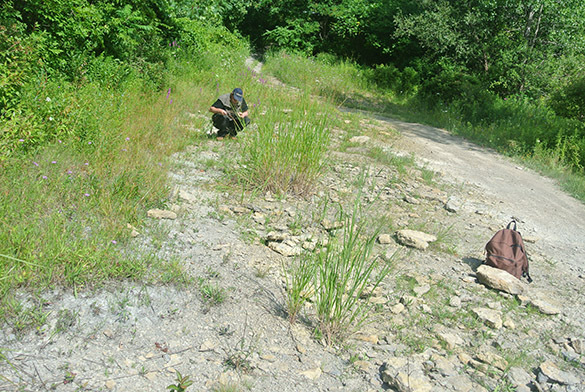 Our goal was simply to look for interesting fossils in the Wanakah Shale Member of the Ludlowville Formation (Middle Devonian) and enjoy the fellowship of fossil enthusiasts. Success on both counts. 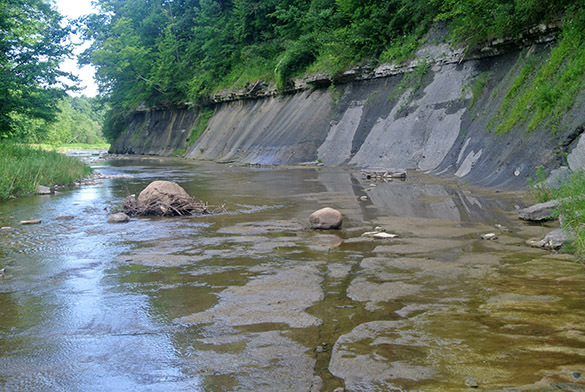 It was a great day, and rather fun wading through the cool waters of the creek as we examined the shale on the banks. 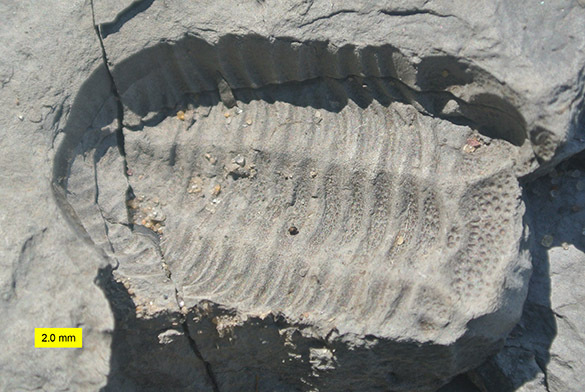 Here is an external mold of a trilobite in the soft Wanakah Shale. An external mold is an impression of the exterior of the organism. If you look at this upside-down it pops into reverse relief! This fossil is not recoverable because it would break into bits with any attempt to hammer it out. Andrej and I found plenty of bryozoans here, along with other cool fossils. As a bonus we also were able to visit the Bethany Center exposure of the Centerfield Limestone, also Middle Devonian. There isn’t much left of the exposure, as you can see, but we still found numerous encrusting organisms (sclerobionts) on brachiopods and the abundant rugose corals. We also got plenty of sun here.